Along with walls, rooftops are the logical frontier of landscape intervention, and although many terms are thrown around to both tantalize and confuse the novice and expert alike. 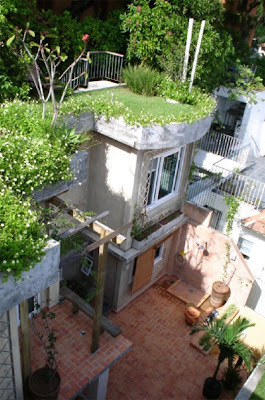 For instance, you will notice my own use of the terms 'ecoroof' and 'green roof' almost interchangably. In my mind they are the same, although 'eco-' is the moniker used here in Portland to describe the 'functional' direction, mostly driven by local green roof pioneer, Tom Liptan. 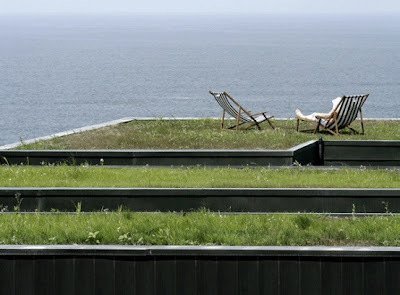 The idea being that a green roof has plants and is not specifically directed towards a sustainable ends, whereas an ecoroof is designed a maintained as a low-input, low-maintenance functional roof. 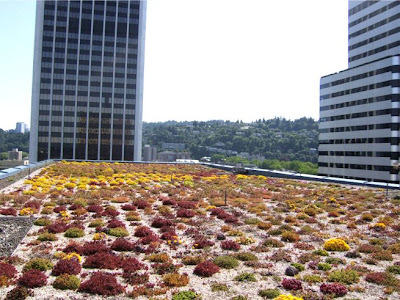 Here we investigate some of the typologies and terms in rooftop greening, from the eco- to the green-, the terrace- to the garden-, and the blue- to the brown-. While eco- is one of those terms like sustainability that tends to be overused to the point of being meaningless, in this case we will differentiate between the eco- and the green- in terms of the type of vegetation that is used and the amount of maintenance that is required. I've worked on a number of these projects, and they range from small-scale residential 200-700sf to large public buildings, 15000-18000sf, most notably the Portland Building Ecoroof (when I was working at Macdonald Environmental Planning). 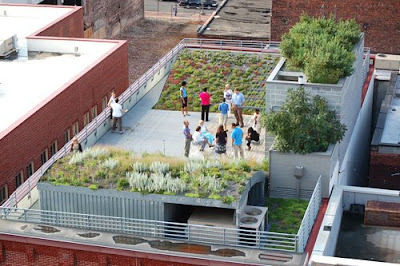 A Chicago project featured in the NY Times uses green roof trays to vegetate the rooftop. A simple and adaptable way of providing greenery in a contained system, trays typically cost more than regular contiguous systems. Benefits include the ability to remove trays for maintenance, as well as eliminating the need for edging around rooftop penetrations. This is not to say a 'green' roof with high levels of aesthetics is not sustainable - it's just a different (and I will admit very regional) subtlety. But enough splitting hairs. 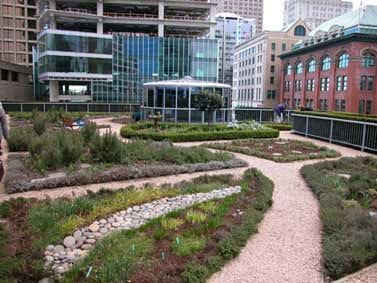 The distinction may also provide some clarity to the difference between extensive and intensive green roofs. Definitions vary wildly, but extensive is typically 2-6" and intensive ranges from 6-18" in depth. 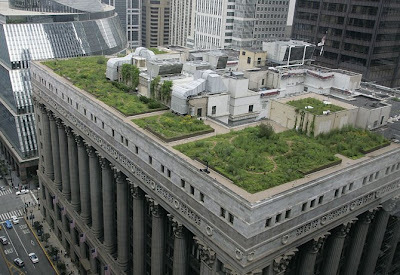 The Chicago City Hall Green Roof is an excellent example, with landform created using rigid styrofoam blocking as well to reduce weight. 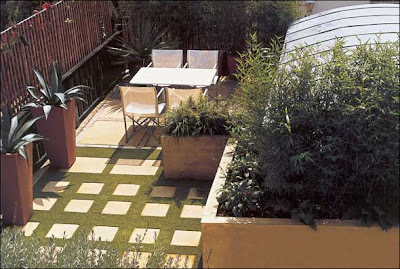 When additional potential habitation is added via paving, planters, more significant vegetation, and furnishings the transition is complete to the roof terrace. "At the same time, as Terry explained, condo buildings aren’t really viable when it comes to green roofs because they are too high up and it wouldn’t be of any benefit. The wind and the temperature change every 6 stories, so the taller the building, the less likely your chances of having an effective rooftop garden..."
Garden roofs are pretty self-explanatory - using the rooftop for urban agriculture productions. There are a countless examples of how you do this, covered previously on L+U. The biggest obstacle to rooftop agriculture is obviously the additional weight. 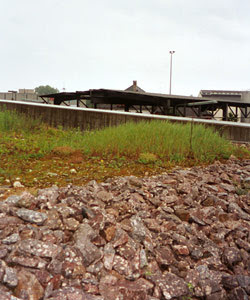 Where eco- and green- roof are developed for low saturated weights, and rooftop terraces - although heavier, can be point loaded or use engineered soils for lower weights. Gardening, by it's very nature, is more dependent on water and organic matter to promote significant annual biomass - and this requires more weight. 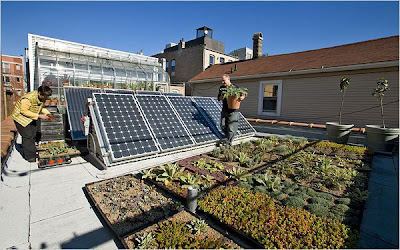 The future challenges for rooftop agriculture is the issue of weight, access, and water use. Fine tuning all of these factors will allow us to maximize production per rooftop square footage. Can you grow vegetables in 6" of soil - or with low amounts of organic matter? These questions will refine and define the next phases of rooftop urban ag production. I'll admit I've always thought the concept blue roofs are kinda strange. Information is sketchy, but the idea is that water is applied - either through ponding or spraying - to the rooftop for a variety of reasons. In our moist climate, the water is held on the roof for detention purposes. Another strategy is to spray or hold water on the roof for cooling - then use this for secondary means. "One of the most interesting and innovative systems introduced to the building was the use of a hydronic system to cool down the the building. 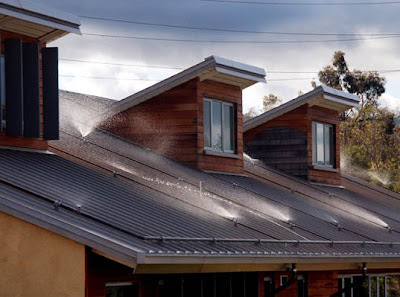 The process works like this: water is sprayed thinly on the roof at night. 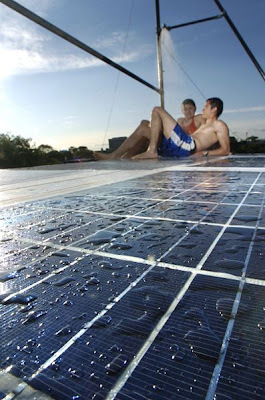 During the coolness of the night, the water is chilled as it runs down the roof loosing heat to the night sky. It is then stored into a highly insulated water tank, where it is later used for the cooling system of the building during the day providing an energy saving of around 90% from that of a typical chilled water system." 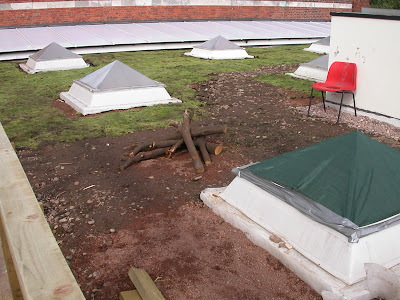 Counter to the 'green' trend is the inventive concept of brown roofs. Using urban nature as a guide. 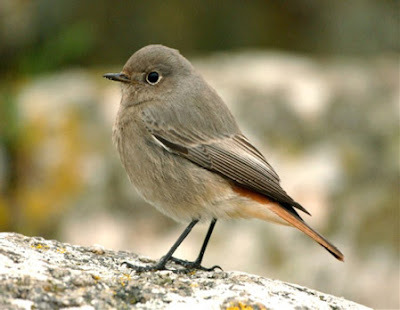 From an article in Green Futures: "...Brownfield sites are the black redstart's favourite haunts, and it colonised bomb sites after the war... birdwatchers are hoping that the current wave of redevelopment and the survival of the species can go hand-inhand. It's the rubble from rundown plots of land that contains the seeds and stones these birds need for their habitat. Take some of that rubble and put it on the roof, says Gedge, and you can then let nature take its course." Manchester's Unicorn Grocery has a rooftop habitat for this local London endangered bird species as well, continuing the trend on a smaller scale. 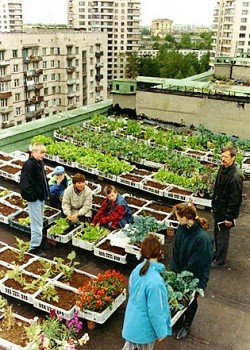 Whatever the goal and whatever the opportunity that exists - rooftops are ripe for multi-functional uses - from greening, ecology, cooling, habitat, and food production. 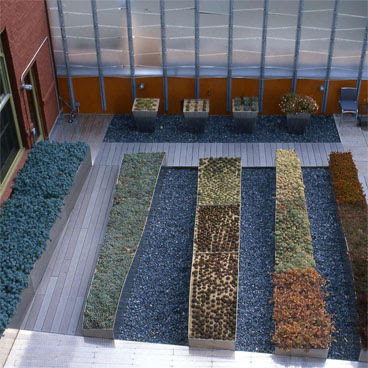 Each have their different needs and benefits - and the ability to maximize the functions of rooftops for these multiple benefits is the next step for rooftop development in Vegetated Architecture. 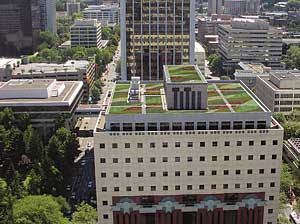 the other use/justification that i've heard here in the PNW for blue roofs is that if you simply raise the collar on the roof drain so that you have, say, 2" of detention area, and add a typical rooftop aggregate to that 2" basin, you have effectively created the raw ingredients for a green roof. over time, soil will develop, seeds will be deposited and you will have a functioning green roof. an interesting urban eco-experiment, but, like you, i haven't seen or read about it in practice. I believe they did an experiment with this on one of the Brewery Blocks (M-Financial) by incorporating the raising of drain collars a couple of inches. The designed the ecoroof around this thinking it would be able to function and hold additional water. It was envisioned that the wet conditions would still allow plants to grow, but poor soil spec led to anaerobic conditions and compaction and poor plant choices led to pretty substantial failure. The project was recently fixed by the developer, but I have not heard if there are still issues. 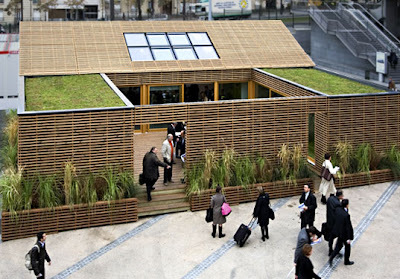 Green Roof in a Box?